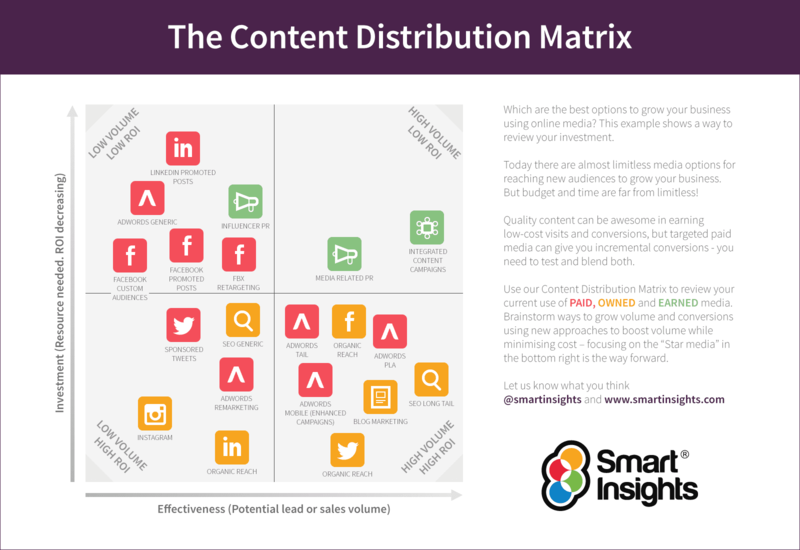 If you’re a regular reader of Smart Insights, it’s likely you’ve seen, or even better, used our Content Marketing Matrix developed with First10. It has proved to be a popular infographic since it’s not just a nice visual of some interesting ‘facts and figures’ about marketing, rather it can actually be applied to get better results since it helps businesses brainstorm the best types of content to create as part of their content marketing strategy. What is the Content Distribution Matrix? This infographic is aimed at helping marketers to review the effectiveness of different types of Paid, Owned and Earned media to promote or distribute their content in generating site visits, leads or sale compared to the level of investment in applying the media measured as paid media costs or the costs of marketing team members. Note that the types of media plotted here are for one example business, so these will vary by company type and sector. Start by marking up the current or past use of different paid-owned-earned media options for your business. Plot each media type on the horizontal axis based on its importance in the number of leads or sales you can attribute to it from a low-level of effectiveness on the left to the highest volume on the right. Next, consider cost-effectiveness on the vertical axis based on the time or money spent on promotion from lowest cost (or better overall return-on-investment) at the bottom to highest at the top. To take a couple of examples, in this case, long-tail SEO, shown in the bottom right quadrant, is one of the most effective techniques since it produces a high volume of leads or sales at relatively low levels of investment. Compare this to paid distribution options shown in the top left quadrant, such as LinkedIn Promoted posts which have a relatively low-level of volume, but highest costs/poorest ROI). Colour-coding can help distinguish the techniques you use. Of course, using the matrix requires businesses to be already set up to measure content marketing effectiveness as explained in our guide to calculating content marketing ROI and the 7 Steps guide to Google Analytics for marketers. This step is easier to explain, but harder to mark up in practice. Here you review the full range of paid-owned and earned media options available to you, in particular. those you aren’t using now. You have to assess what you think they could contribute in advance of a test to prove or disprove your hypothesis. In this step, you can also consider how other businesses are using content distribution in your sector. Since you won't have access to their analytics, this can only be based on an assessment of the types of techniques you see them using and any results you hear them reporting. Finally, you can discuss which options could be worth trialling in future tests, based on your discussion. There will likely be several new options, so it’s a case of reviewing and setting up a schedule of what to trial and test. An additional use of this visual will be to consider new content partners who can be compared in a similar way. Why create the Content Distribution Matrix? Since we devised the content marketing matrix a couple of years ago, I have used it many times as part of breakout activities within in-company workshops to help discussions of how content marketing can be improved. It tends to work really well since everyone just ‘get’s it’ and can swiftly move on to thinking about new ideas for content assets. At the same time, I felt it needed a follow-on activity to help businesses do a similar type of gap analysis of how they’re promoting their content, or as many content marketing gurus call it, ‘content marketing distribution’. Content marketing distribution is aimed at getting the most from your investment in content assets by using different forms of paid, earned and owned media to enable you to reach your target audiences (see our Paid vs Owned vs Earned definition). The Content Distribution Matrix was inspired by a well-established method of reviewing different digital media based on plotting the effectiveness of a media channel against the resource or media investment required. For example, Marketing Sherpa used a similar visual plotting the effectiveness of social media for content sharing (see excerpt for example chart). You will see from our example, that there are many paid media social media advertising options now available, so this matrix can be used a reminder of what to test and if it’s not effective, then you can move on to test new techniques as they become available. As with all of our infographics, we look to update them based on the feedback we get, so do let us know if there is anything that needs more explanation, or ideas you have for improving the Content Distribution Matrix. Thanks!